Before you decide on a website, you need to take some time thinking about your requirements. The following is some of the considerations that you should take some time to examine before you move onto choosing a design for your new site. AUDIENCE—Who is your target audience? What are characteristics of this audience? (consumer, business to business, etc.) Who do you want to serve with the site customers and/or suppliers? PURPOSE—What is the purpose of your site? Do you have a clear picture of the business need the site will fulfill? Will your site contribute directly or indirectly to profitability? GOALS—How does the proposed site tie in to company goals? Will you sell a product or service online? Will you provide a sample portfolio of products or work online? How does the site help you obtain or retain customers? SIZE—How big will your Web site be? Larger sites cost more money; will your site be five pages or 500 pages? Have you thought about limits for the size and scope of the site? 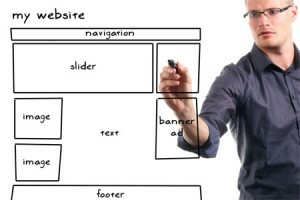 INTERACTIVE—Will your Web site offer interactive features to visitors? Can visitors send email, order a product or request information? How can the site give you feedback? WEB HOSTING—Do you plan to maintain the computer server for your Web site in-house? Will you contract for an Internet Service Provider (ISP) to host your site and make updates? SERVER VENDOR—If you maintain your own server, does the server vendor understand the needs of your ISP? Does the Web server have fault-tolerant features, so you can be up and running 24 hours a day, seven days a week? ISP—Do you know what an ISP is? Have you selected an ISP? Will you have dial-up access to the Web site to make changes? ONLINE SALES—Do you plan to make sales online? If so, does your ISP offer a "secure" server? Are you able to handle credit card payments? CONTACT RESPONSE—Who will be responsible for responding to email messages from your audience? Can you respond to email messages within 24 hours? CATEGORIES—Have you decided what the main categories or sections will be on your site? Will the categories link to products and services or to more general subject areas with sub-categories? FLOWCHART—Did you think about preparing a flowchart to identify all the components of the Web site? Have you identified what subjects within the site might link to other subjects? COMPUTER PROGRAMMING—Will you need custom computer programming to enable features on your site? Do you plan to have a guest book, shopping cart, order forms or a calendar of events? Do you want any information or interactive inputs to be related to a database for marketing or sales purposes? COMPETITION—Who are your competitors online? Of those, which competitor sites do you like and why? What competitor sites do you dislike and why? How can your site beat the competition? HOT LINKS—What Web sites would you like to link to? What Web sites do you want to link to your site? Have you thought about registering your site with search engines? TEXT & GRAPHIC SCANS—Is all of your content both text and graphics in electronic form? Will you need to have photos or artwork scanned into electronic format? SEARCHABLE—Do you want your entire site to be searchable by users? Have you thought about what vendor can help you set up this and other features? FREQUENCY—How often will your Web site be updated? Do you plan to update daily, weekly or monthly? HYPERTEXT MARKUP LANGUAGE (HTML) SKILLS—How proficient are you or the person(s) maintaining your site with HTML? Can you afford to have a vendor update your site or do you need to update in-house? STAFF VS VENDOR—Who do you foresee maintaining your site? How much will it cost? Will staff prepare content and a vendor handle HTML conversion and posting to the Web site? Are you willing to pay a monthly fee for site maintenance? TRAINING—If you or your company will maintain the site, have you planned for online administration tools? Will you or an employee need HTML and web site management training? MARKETING TOOLS—What forms of marketing will you use to promote the web site? Do you plan to place the Web address on all stationery, business cards and brochures? Will you place ads, send direct mail or market the site online or a combination? INTERNET PROMOTION—Are you planning to register the site with search engines? Will you contact the media to review your Web site? Do you plan to buy any Web banner advertising on other sites? STATISTICAL FEEDBACK—What do you want to know about visitors to your web site? Do you want to know where they came from to reach your site? Do you want to know what pages on the site were viewed? Do you need to know the total number of hits and page views? ACCESS LOGS & REPORTS—Who will review the Web sites access logs which record some of the statistical information mentioned above? Will reports about hits, page views and popular site elements be compiled monthly? The World Wide Web has the potential to contribute significant profits to your business by expanding your market area, providing suppliers information about your current inventory levels, giving customers online access to product catalogs, allowing online purchases, and by simply bringing attention to your company. However, a Web site can also be a drain on company resources: if it is not set up with users in mind, if usage isn't measured correctly, if top management isn't committed to maintenance of the site or if the site is poorly organized and doesn't attract visitors. Plan your Web site before you spend money. With forethought you can create a powerful Web site for your business. Web design in Dublin is a very competitive business. We at Acornmedia Design Studios strive to be the best at what we do through a usage of the most modern web trends coupled with a price that simply won't be beaten.